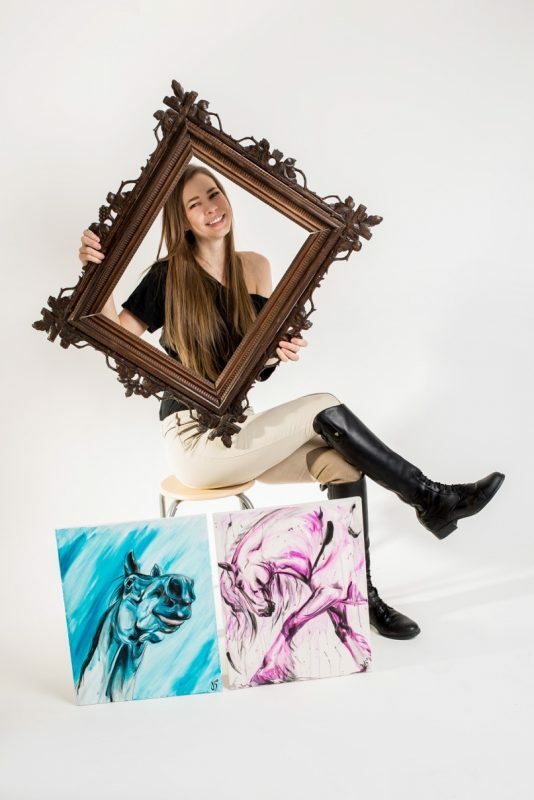 Paintings “Out of the Blue” and “Pretty in Pink” were inspired by Kasia’s horses Slawny and Roxy. 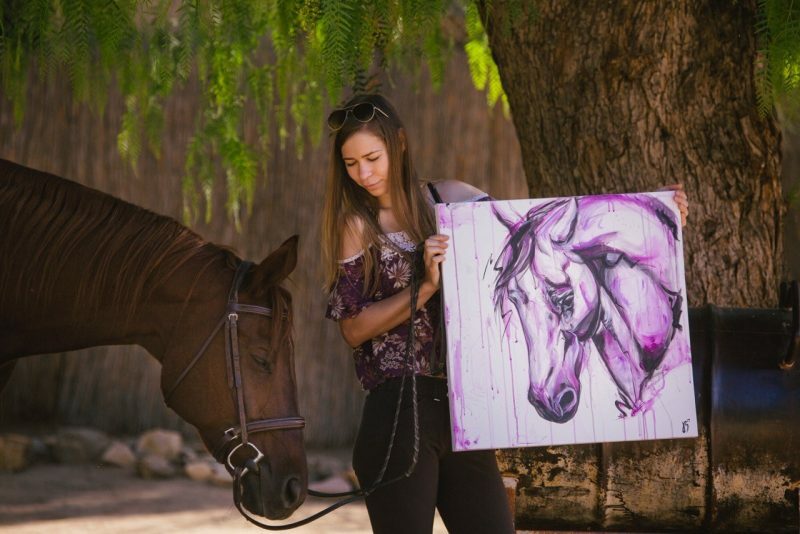 Equestrian artist Kasia Bukowska doesn’t just love horses; her passion has led her to relocate across the world, attracted her now-husband across an immense language barrier, given her the fortitude to overcome debilitating illness and driven her to create and market her unique equestrian art. Finger-painting “Confetti” was inspired by Kasia’s horse Lulu. 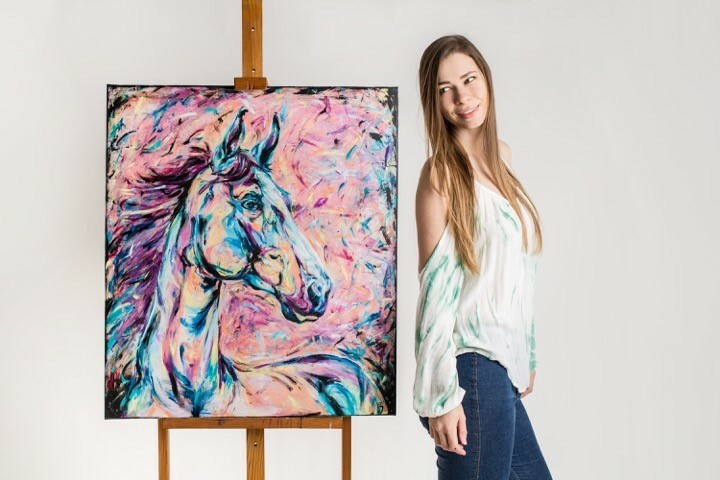 “The painting depicts the life, color and positive energy Lulu brings to my life,” Kasia said. 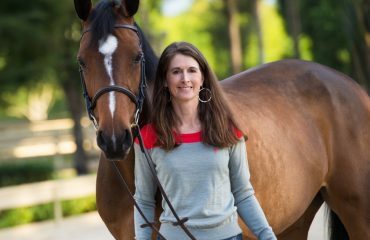 Though she’s now grown, living halfway around the world and enduring incredible life trials, one thing will never change: Kasia still won’t let anyone or anything separate her from horses. “I have a love of all drafts, purebred or not,” Kasia said. Many of her pieces, such as “Draft Horse,” are inspired by the gentle giants. Their language barrier soon became a trifling obstacle in comparison to the one Kasia had to overcome, with incalculable help from her husband. Kasia’s husband knew just what to say. “He looked me in the eye and said he’d build me a barn with his bare hands, and promised I’d get my dream Shire. He said my horses would hang out in the field behind our future home and I’d be able to see them whenever I wanted. 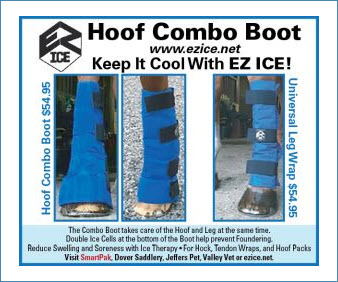 I kept arguing I wouldn’t be able to ride and it’d be such a waste to keep them and do nothing with them. In all his patience, he lovingly assured me I’d be busy with the horses — he explained how I’d have to give the horses kisses and carrots and that would last about all day. 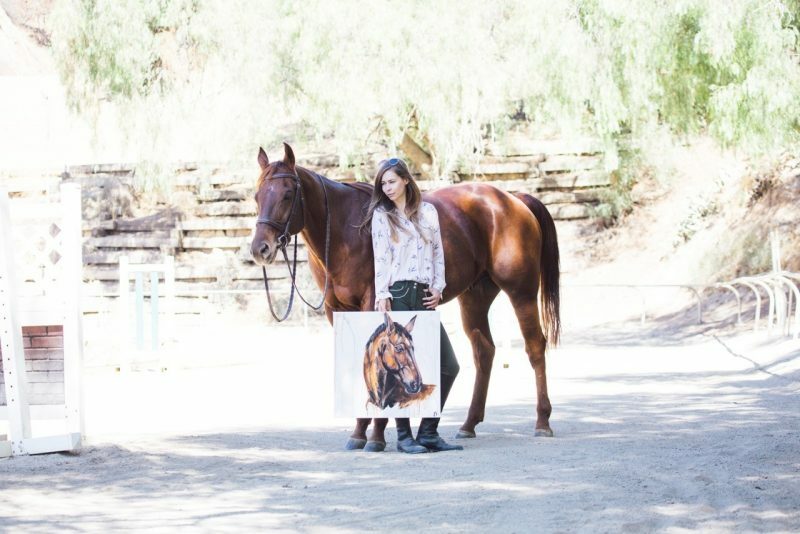 Kasia’s commissioned work includes “Dexter,” pictured here at Leslie Figge Stables. During a flare-up after several undiagnosed months, Kasia flew back to Los Angeles where she was admitted to USC and finally diagnosed with lupus and fibromyalgia. 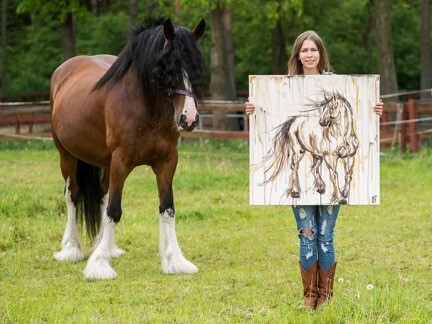 Kasia’s reputation as an artist has grown and enabled her to add three horses to her “collection,” which are often the subjects of her paintings. Slawny, the gray horse that first drew her to Poland, features most frequently. 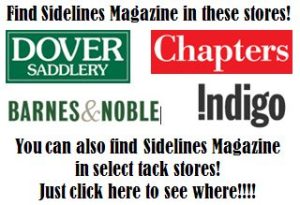 Draft horses, which have always had a special place in Kasia’s heart, are another trend: Kasia currently owns two Shires, and hopes someday to start a rescue to save drafts from slaughter, train them to be ridden and find them homes as ideal trail or pleasure horses. 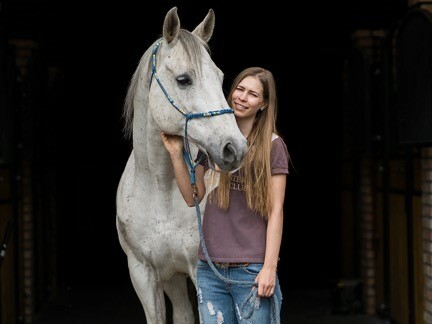 With her condition under control for the moment, Kasia is looking forward to exhibiting her art at international horse or art shows in 2018 — and getting back into the show ring herself. 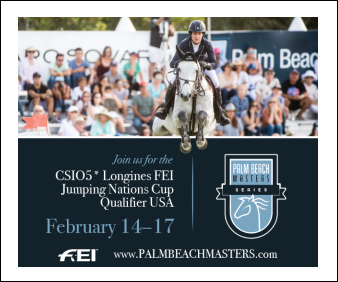 “I plan to compete on Slawny this summer in some little schooling shows in the .80m and 1.0m jumpers, just for fun,” she said. 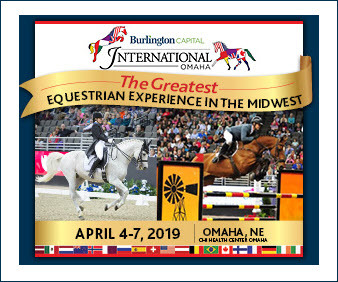 Kasia also hopes to take one of her other horses to a dressage schooling show, and has high hopes for the jumping potential of her young mare, Lulu. 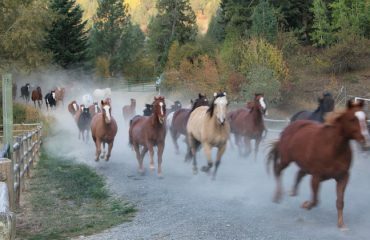 She’s training all of her horses herself, and keeps them in her backyard.